Dr. Ross Downes Bsc MBBS DM EMHA, a native of St. Lucia, completed his postgraduate training at the University of the West Indies. He received additional training in laparoscopic surgery having received multiple certificates. He is the pioneer of single incision/scarless laparoscopic surgery in the Bahamas. He serves on the consultant staff at Doctors Hospital. He is a member of the Society of American Gastrointestinal endoscopic surgeons(SAGES) and actively participates with Society of Laparoscopic Surgeons. He is also a member of the editorial board for the academic journal Clinics in Surgery. 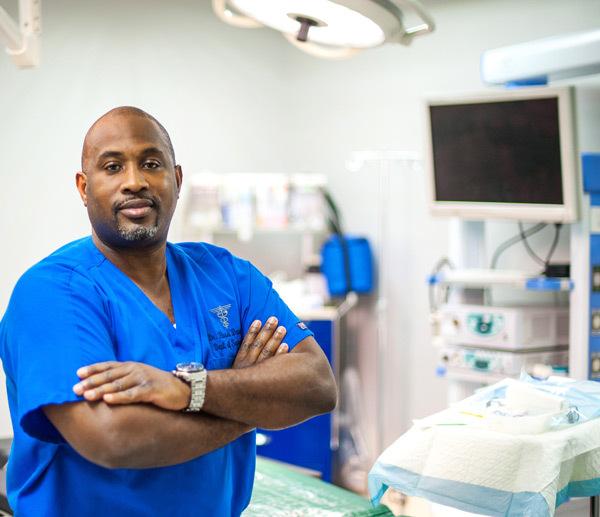 Dr. Downes is a General and Laparoscopic Surgeon at The Surgical Suites and the managing director of the The Surgicentre, the premier Ambulatory day surgery facility in central Nassau. Dr. Downes has collaborated with Family Medicine Center to make his services more conveniently available to people on the western side of New Providence. Contact 702-9310 for a consultation.